Selling things online is something I think a lot of us have considered doing. And even if you haven’t considered selling things yourself, it’s likely that you’ve had clients who were interested in doing so. But getting an ecommerce site setup, even for designers and developers, can be a pain. It’s often time-consuming, frustrating, and requires a lot of administrative-type work that’s not very much fun. Instead, a service like IzzoNet can really make it simple to get your online store up and running in just a few easy steps. First, start with a theme for your site. 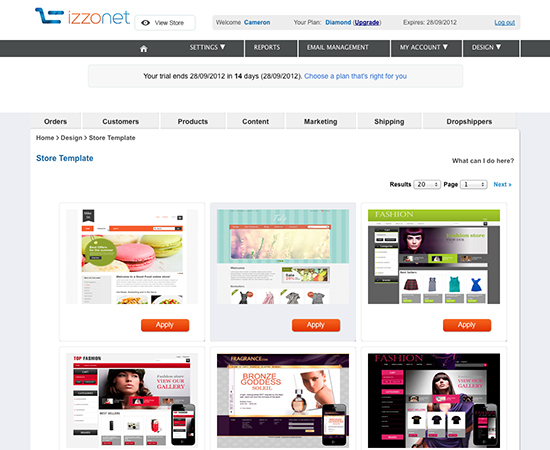 IzzoNet has tons of themes you can use, to suit just about any type of storefront. You can make modifications and customizations to the CSS of any theme you choose, and you can even download the CSS file as a backup (which you’ll want to do before making revisions). Once your theme is installed and customized to your liking, you’ll want to add content. You can start with things like an about page, add additional pages, or edit the system-generated content pages (which include things like order thank you pages and help pages). Next up is adding products to your online store. It comes pre-populated with products so you can see exactly how the product listings work. The product list includes an image, SKU, product name, category, price, sale price, cost, revenue, quantity, the date of the last update, and options to edit, copy, or delete each item. Adding a product is simple. You can include up to twelve images per product, as well as plenty of information about the product. 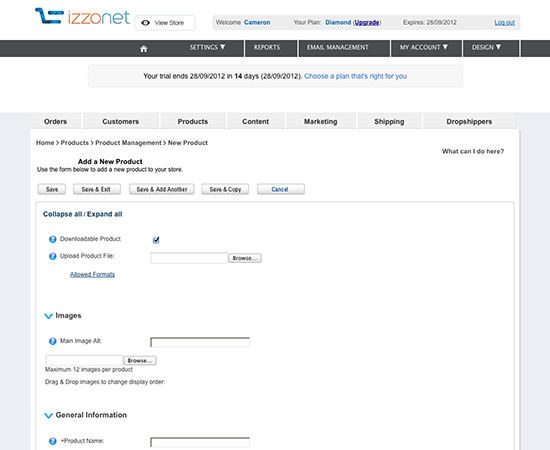 IzzoNet even supports downloadable products (just check the box at the top and you’ll be able to upload a file). You can include as much or as little information as you like about each product; the only required fields are the product name, price, and category. Products can include a lot of extra info, too, like shipping info, additional price info, product promotions, search engine optimization, Ebay information, Facebook info, and more. You can also access the product category listings from the products section of the backend, where you can activate or deactivate categories, as well as add new product categories. 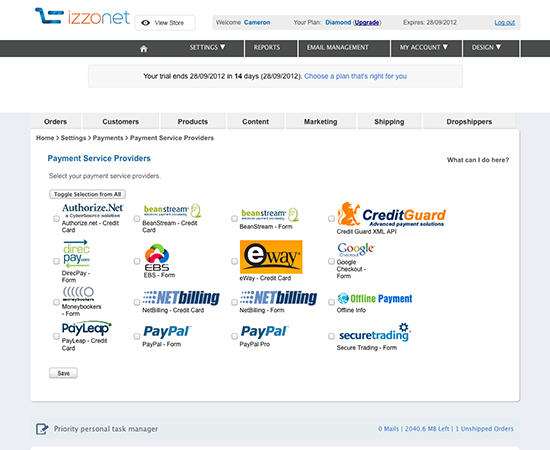 IzzoNet: Flexibility in payment methods, local taxes, your own domain. What else? Once your content, products, and payment types are set up, you can move on to set tax information. You can even set it so that tax is included in the product price, or disable taxes and VAT all together. After everything is set up, you can set your store’s domain. You can keep the IzzoNet subdomain from the original setup, or you can use a custom domain. Options there include registering a new domain name through IzzoNet, transferring your domain name to IzzoNet, or using a domain that remains registered elsewhere. That’s all there is to getting up and running with IzzoNet. It doesn’t get much easier. But that’s not all IzzoNet can do for you. There are various sales reports you can generate from your site’s sales figures. That includes financial reports, products, suppliers, email addresses, and more. 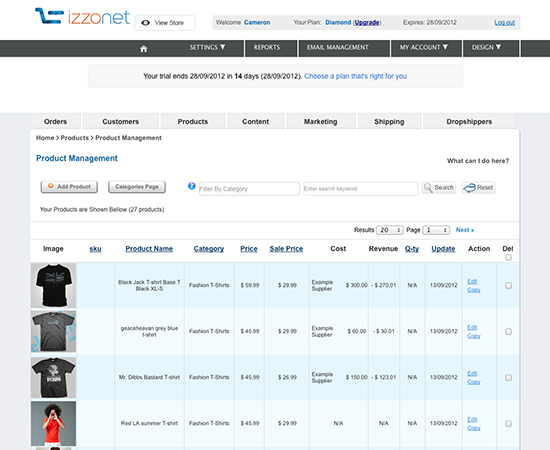 One thing IzzoNet includes that isn’t included in a lot of ecommerce solutions is dropshipper management. IzzoNet includes supplier integration where your suppliers can actually log into your IzzoNet account and get updates about your products. You can create a supplier database, and even run an analysis on your suppliers to determine who’s best. IzzoNet will also automatically send your customers tracking numbers for their orders, whether they’re sent from your or directly from a supplier. This greatly simplifies your order workflow. In addition to managing your dropshippers, IzzoNet makes it easy to establish yourself as a dropshipper, too! You can manage everything right from the same control panel, provide your clients with their own unique logins, and even present special pricing to individual clients. 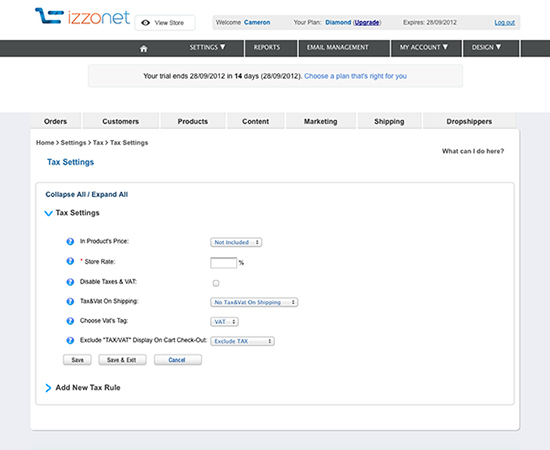 IzzoNet also includes a number of social media tools that are sometimes lacking in other ecommerce solutions. While sharing your products to Facebook is pretty simple, IzzoNet goes a step further and makes it easy to set up a Facebook store. There’s also an online store mobile app, a store management mobile app, and even a “webcam social shopper”, which lets your customers see how a desired item will look on them. Pricing for IzzoNet starts at less than $20 per month for their Gold plan, and with many more features available for just twice that amount. Certain features (including the ability to become a dropshipper) are only available in their top-level account, which is significantly more expensive at just under $300/month. This looks good, but it leaves the problem of the traffic source. Bought traffic is only good if you can get it cheap enough. Wow, this is a pretty blatant advertisement for this particular shopping cart. I’m not sure I see the same appeal you guys do. Looking through their feature list and the above article It doesn’t appear to allow for product variations (i.e. color, size) and different prices, images, and weights for those variations – so that cuts out a huge portion of the eCommerce market. I see that they mention Google in their list of product comparison. I wonder, though, if they’ve made the update from Google Base to Google Product Search. Still, to even get that feature and to be able to have a multi-language store, you have to pay $100 a month, and well….that’s a little steep. Looks like a new platform for e-commerce? Will definitely look more into this new site. The templates provided by IzzoNet are catchy enough. But I wonder it is possible to hide the product if it is out of stock. I want the out-of-stock product page to stay live and active but hidden in the product list, not visible to customers. I used WordPress with eCommerce plugin, but got disappointed as there is no such option. 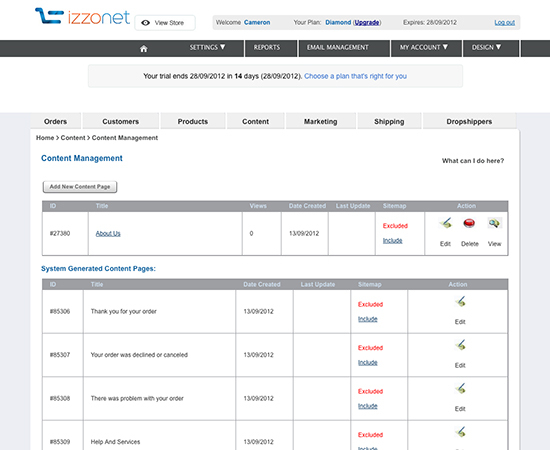 Right now I’m testing other eCommerce engines and IzzoNet looks promising. Cameron, thank for the review.